You’re late, you’re flustered and in a panic about how your boss is going to react when you get to work or how your mother-in-law is going to feel about you missing the birthday cake. We’ve all been late at one point in our lives and it’s important to have a store of excuses for when you are in trouble! These excuses that we have ever so graciously put together for you will get you out of any situation you’re put in. Be careful not to use them too often though, people will start realising that you are making up excuses! The other option of course is to be on time and punctual, but who really has the time and the patience to do that? There will be new terms in each dialogue that will be put in bold. Then at the end of the dialogue we will explain the terms one by one. Traffic can ruin anyone’s day. If you have to drive long distances to get to work it’s likely that you will run into traffic, which is when cars, buses and other vehicles have to form long lines due to the amount of people trying to use the roads. You can spend hours of your life sat in traffic, isn’t that sad? So, if you don’t want to cycle or walk to work here is a sample dialog of an excuse using traffic. Ria: Damian, you’re 20 minutes late! Damian: Yeah, I’m sorry Ria, I got stuck in traffic. Ria: Stuck in traffic? Are you sure you didn’t just leave late? Damian: Honestly! I take the motorway to work and it was completely gridlocked. It’s because I have to travel in rush hour. Ria: Hm, well I still think that you should be leaving earlier. This is the sixth time this month that you’ve been late and it’s not acceptable. Damian: Come on Ria, what can I do about traffic? It’s not my fault! Ria: That’s true, but please try to plan ahead for traffic incidents in future. Damian: Okay, I will get up earlier and I will try to listen to the traffic updates on the radio before I leave. That way I can plan an alternative route if I need to. Ria: That sounds good, Damian, thank you. Damian: You’re welcome, Ria, I apologise. When you have to drive slowly or stop because of the number of vehicles on the road. A large road that is designed for lots of vehicles to travel at high speed. When traffic is so bad that cars cannot move. 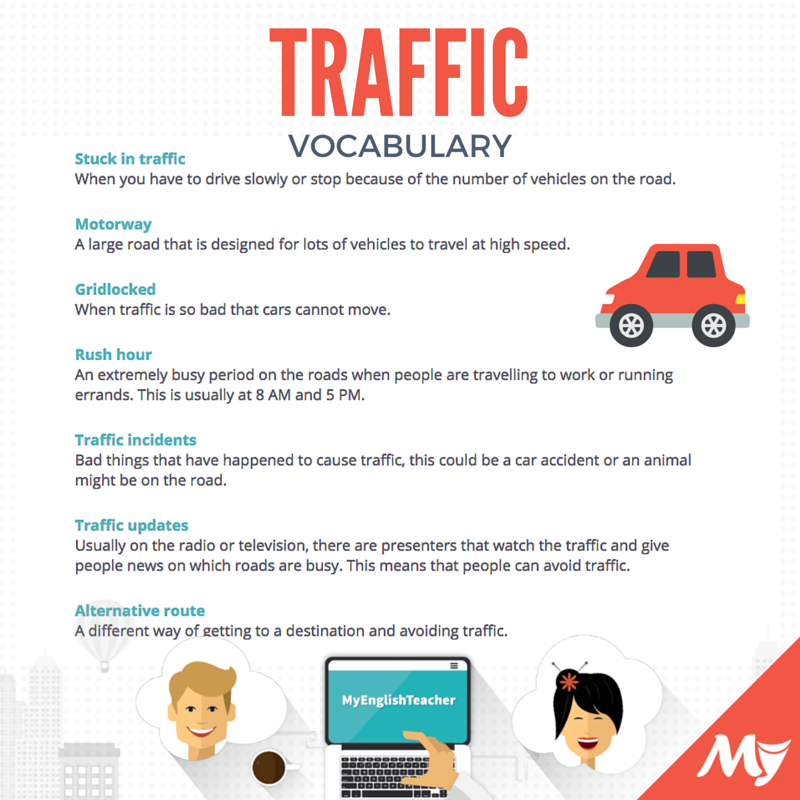 An extremely busy period on the roads when people are travelling to work or running errands. This is usually at 8 AM and 5 PM. Bad things that have happened to cause traffic, this could be a car accident or an animal might be on the road. Usually on the radio or television, there are presenters that watch the traffic and give people news on which roads are busy. This means that people can avoid traffic. A different way of getting to a destination and avoiding traffic. There are so many excuses you can use that involve your family and if you have no problem in blaming them for something that is probably your fault, then you’re onto a goldmine here! Then again, if the people to whom you are giving the excuse know your family and see them often, your excuse might not work very well! You need to make sure that they can’t figure things out. This is particularly difficult in our modern times of social media. Anyone can search Facebook by name and find the person they are looking for in seconds. Charles: Sorry I’ve been so busy lately guys, I’ve had so many family problems! Charles: Yeah, first my poor old grandma passed away, that was sad, she was 86 and it was a shock to us all. Yolanda: That was when you couldn’t come out for drinks with us, right? Ben: That’s really strange because I was talking to your grandma down at the shops the other day. Charles: Um… Are you sure? Charles: Oh yeah, sorry, I meant my great grandma. You didn’t know her. Yolanda: Charles, why are you making things up to not hang out with us? Charles: I’m not I swear! There was another incident the other day when you invited me to the theme park. I really wanted to go but then my daughter fell ill, we were really worried about her but she got better. Ben: Charles, I saw your daughter at school when I went to pick up my son. Charles: That must’ve been someone else, she was off school all week. Yolanda: Charles! You’re lying through your teeth! Ben: Yeah if you don’t want to hang out with us then you don’t have to lie about it. Just tell us. Charles: I love hanging out with you guys! I swear I’m telling the truth. Yolanda: Well we are fed up of your excuses. If you want to spend time with your friends in future then give us a call. If not, then don’t bother. Charles: Okay, I will call you guys soon, I promise. A polite and kinder way to say that someone has died. If someone is making things up, they are inventing lies about something. A strong way to say that you are telling the truth. A way to say that someone has become ill or sick. An expression to say that someone is obviously telling lies. To hang out with someone is to spend time with them. Use this only with friends as it is very informal. It’s also more common in US English as opposed to UK English. A stronger way of saying you are tired of something. That pesky thing that we all hate, but it’s just doing its job! The alarm clock is the device that we use to wake us up at a certain time every morning. Usually, the natural response is to turn it off and go back to sleep, but we can’t do that unless we want to be late for the day ahead. Some people are very lucky and they don’t need an alarm clock to wake them up. I don’t know about you, but I am not one of those people. Tim: Sorry I’m late Bob! Bob: Tim, again? This is becoming a habit. 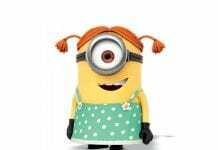 Tim: It’s my darned alarm clock. Every night I set it for 7 o’clock in the morning but sometimes it just decides to not go off. It’s got a mind of its own! Bob: Then just buy another alarm clock! Yours doesn’t work! Tim: I know, I will buy another one later. It has to be done. Bob: Good! But you’ve said that a few times now. Make sure you stick to your word this time. Tim: I will, I promise. A polite way of saying “damned”. This is a way of insulting something. When you set up your alarm clock to wake you up at a certain time. It’s got a mind of its own! When something has a mind of its own, it doesn’t act in the way that you would expect it to act. Another way of saying it must be done. To stick to your word means that you keep a promise and you do what you say you’re going to do. 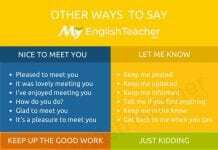 How to Use AT, IN, ON in English? Public transport can be a good option if you do not own a car or a bike and it is too far to walk to your destination. Public transport includes things like buses, trains and cable cars. 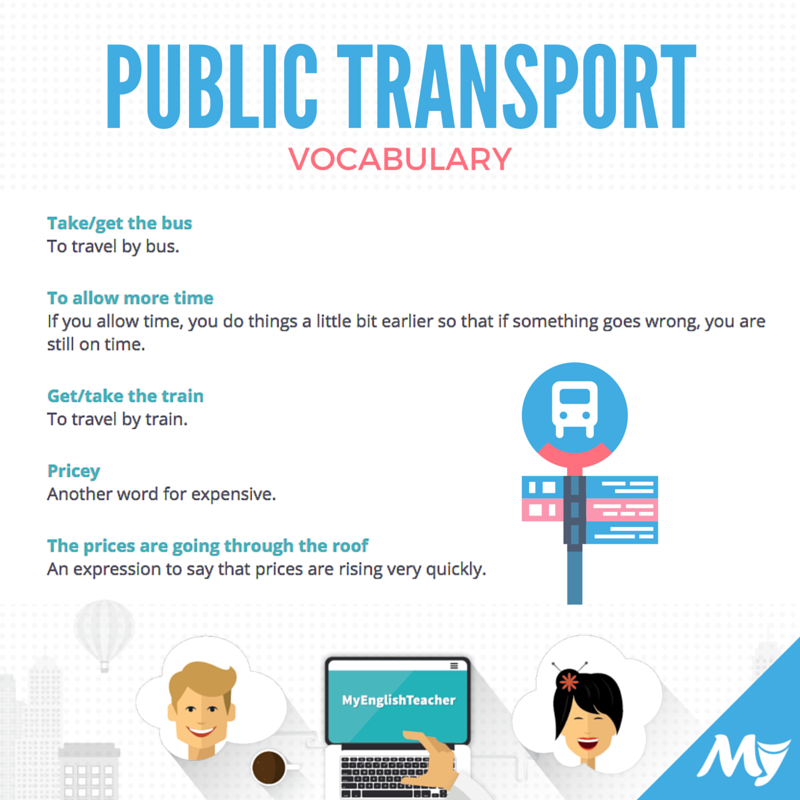 Usually, you have to pay to use public transport and you expect that it will arrive on time. In reality though, public transport has issues with being punctual and keeping up high standards. It’s important that you leave early so that you don’t arrive late! Fran: Sorry I’m late George, I had to take the bus again. George: Fran! What have I told you about public transport? Fran: I’m really sorry, my leg was hurting and I needed to get here somehow! George: Okay, I understand, but you have to allow more time with public transport. It’s always late. Fran: I know that now, perhaps tomorrow I’ll get the train. It’s a bit quicker. George: Just remember that it is quite pricey to take the train. Fran: That’s true. The prices are going through the roof. I’ll think of something. If you allow time, you do things a little bit earlier so that if something goes wrong, you are still on time. An expression to say that prices are rising very quickly. Your car can sometimes be your best friend and other times it can be your worst enemy. You just never know what it’s going to do! If your car breaks down and you can’t use it to drive to work you have the perfect excuse. But only if you live far enough away from work that you can’t walk. Usually, when it works, the car is the most convenient and most comfortable way to get to work in the mornings. You can listen to music while you drive, you can recline your seat and in some cars you have personalised temperature settings. But what if the car isn’t working? Sometimes, if you’re late, you can pretend that your car has broken down and you were not able to get to work on time. Darren: Lee, why are you so late? Lee: Didn’t you hear? I called the front office. Lee: My car broke down and I had to wait for the mechanics to come and fix the problem. Darren: Really? Are you sure you’re telling the truth? Lee: Yes! It was something to do with the wheels, they weren’t working properly. Darren: Okay, if you say so. But couldn’t you have just walked? You only live around the corner. Lee: Um… Yes that’s true but I have a bad leg so it wouldn’t be a good idea to walk anywhere. Darren: Just don’t let it happen again, Lee. The main office in any organisation that deals with calls and other communications. In this instance, this is when a car stops working during a journey. People that work with cars to try and fix them. A car has four of these. They allow the car to move. An expression to show that something is very close. To say you “have a bad” body part, it means you have a problem with that body part and you are in pain. This is a pretty extreme example! If you have an excuse that involves the police, you better know that your manager or your boss isn’t going to check your story with the police to see if it’s true. It could be very easy for them to find out if you’re lying. There are a lot of examples of excuses to do with the police but we are going to take a look at a common one. Hopefully you don’t experience anything more serious on your commute to work. Gerry: Hamish, you’re late again. What’s the excuse this time? Hamish: Boss, this time it’s a real one. I was pulled over for speeding. Gerry: Really? That’s not good. Hamish: No it’s not, but I was only going 2 miles per hour over the speed limit. It was so stupid. Gerry: Well, you were technically speeding. Hamish: Yeah, but come on, 2 miles per hour faster than the speed limit is not hurting anybody. Gerry: Maybe, but Hamish, maybe you should leave home a bit earlier to make sure you can get to work on time without speeding. Hamish: Yeah, you’re right. I just hate getting up early! It’s horrible! Gerry: Nobody likes it, Hamish, but you have to do it sometimes! When the police tell you to stop at the side of the road. When you are driving faster than the speed limit. The speed at which you are allowed to travel on a certain road. Again, this one can be checked so you better make sure it’s either true or that you have a friend that’s a doctor! People are generally allowed to miss hours or even days of work to go to the doctor’s. It is seen as something that needs to be taken care of and not even your boss can stop you from caring about your health. But, some people will make up reasons to go to the doctor’s and will even lie about being ill.
Are you one of these people? If so, this dialogue is for you! Victor: Sarah, where have you been? Sarah: I told you, today was my doctor’s appointment. I’ve been suffering with the flu for weeks now. Victor: But you seem okay! How did it go? Sarah: It was alright, he gave me a prescription to get rid of the rest of the flu. I’m nearly over it now. Victor: Well that’s good. If you don’t feel well you shouldn’t be at work. Sarah: Yes, but I missed work last week. I don’t want to be off sick this week as well. Victor: Okay, well take it easy and if you feel bad then go home. 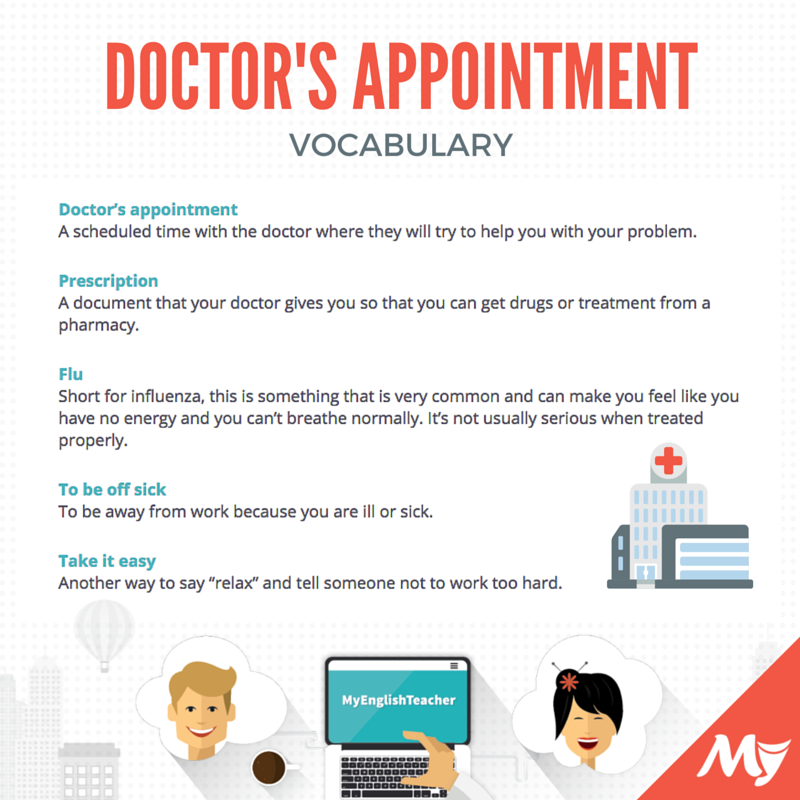 A scheduled time with the doctor where they will try to help you with your problem. A document that your doctor gives you so that you can get drugs or treatment from a pharmacy. Short for influenza, this is something that is very common and can make you feel like you have no energy and you can’t breathe normally. It’s not usually serious when treated properly. To be away from work because you are ill or sick. Another way to say “relax” and tell someone not to work too hard. This one depends where you live, if you live in a sunny place where there is never any bad weather then this probably doesn’t apply to you. This excuse mainly applies to those living in countries that experience challenging weather on a regular basis. There are many circumstances that mean people cannot get to work because of the weather. Public transport can shut down, cars will break down and roads will close all because of bad weather. Of course, if you receive regular bad weather, you are probably prepared and will be able to travel to work without any problem. But what if you are not used to extreme weather? Jane: Have you seen the weather outside? It’s snowing! Derek: Yeah I know, that’s why I was late this morning. It was snowing last night and they closed some of the roads. Jane: Wow, really? I haven’t had any snow by my house. Derek: That’s strange! The roads near me have been frozen for weeks and it’s been very dangerous to drive. Jane: There is a train station near you, isn’t there? Why don’t you just get the train? Derek: The train station has been closed too, the tracks have been too dangerous. We aren’t used to this much snow. Jane: That’s true, we don’t make allowances for bad weather like this. Derek: The people near me are outraged because they can’t go anywhere! Their roads are shut, their railways are shut so they are stuck in their houses. Jane: That would be horrible. I can’t stay inside for too long otherwise I get bored. Derek: Yeah me too. That’s why I’m here! You are allowed to travel in an emergency, luckily for me. I don’t want to lose my job! When something falls below it’s freezing point. In this case, water on the roads has become ice so the roads are not safe. Trains travel by driving on these. They are made of metal and wood. If you make allowances for something, you prepare for something to happen so that you are ready when it comes. Another word to say that someone is very angry about something. So, that’s your grand list of excuses for being late! We hope that you never need them and that you are punctual wherever you go, but just in case, these should help you to be prepared. If you have any questions or comments please enter them in the space below. No excuses!